Edraw is a visio-like software with more examples and templates. Compatiable with Mac, Windows and Linux. Edraw is a Visio® like flowcharting, organizational charting, network diagramming software with more examples and templates. It is a rapid and powerful diagramming software which creates business charts and business forms with minimum time loss. It supports flowcharts, organizational charts, business charts, hr diagrams, work flow, maps, project management and network diagrams. Visio helps you define and visualize ideas, information and systems. It enables easy assembly of diagrams through dragging predefined Microsoft SmartShapes® symbols coupled with powerful search capabilities to locate the right shape, whether it is on a computer or the Web. 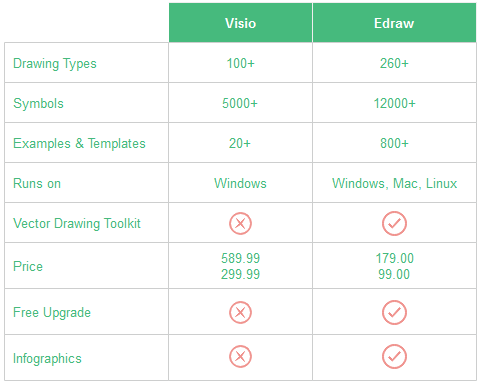 Edraw is also a desktop software producing vector diagrams like Visio. It has the same drawing method - drag and drop. 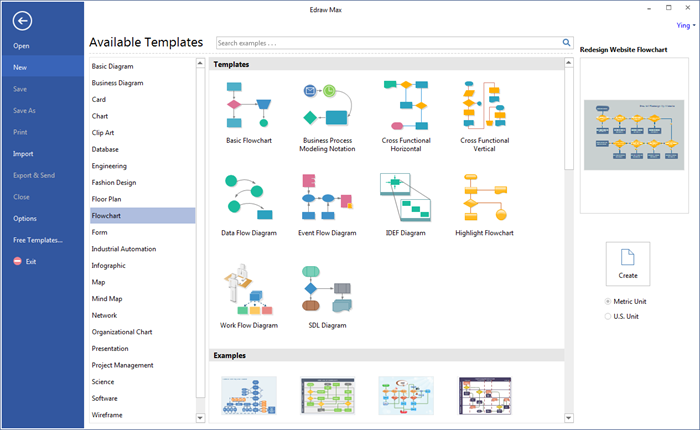 Lots of Visio users have turned to Edraw because it contains more templates, symbols and examples, and it's much cheaper. From Edraw Max V4.2 version, all Edraw products can import the Visio XML files. Our program is capable for 260 types of diagrams. You can find hundreds of symbol libraries containing more than 12000 symbols in the software. Although Visio is a powerful product, it is best suited to technical experts. It can be overwhelming to the average business user who just wants to draw presentation-quality diagrams, without having to learn a complex program. Our program provides sample drawing power while remaining easy enough for anyone to use. Like Visio, Edraw is fully integrated with Microsoft Office. Adding Edraw drawings to Word documents, PowerPoint presentations, or other Office documents is as simple as Copy and Paste. Drawing does not need to start anew. Just drag the ready-made shapes from the library pane and drop them on your page. Drawing couldn't be easier! It provides pre-defined color scheme and style. Edraw Max's standard tech support is both legendary and free! You deal directly with experts, not someone reading your answers from the knowledgebase. Recognized by Deloitte and Touch as one of America's fastest growing companies, Edraw Max is a dependable business partner that has been setting the standard in software support for more than 10 years. 1. Helps you look like a graphics professional, even if you can't draw a straight line! 2. Easy "drag-and-drop" drawing skill required! 3. Works hand-in-hand with Microsoft Office. 4. Automatic alignment for neat, crisp drawings. 5. Rich built-in symbols and templates. 6. Add real photos using the Image Plug-In. 8. Built-in flow chart templates and examples. 9. Import your own symbols and clipart, too. 10. Print anything from tiny labels to huge posters. 11. Save your drawings for the web as GIF, JPG, or HTML. 12. Easily convert drawings made in other software. 13. It is built to work easily with other programs, Word, Excel, PowerPoint and PDF. The types of diagrams that can be create by Edraw include bu not limited to the samples shown above. Refer to diagram types for more information. Your Edraw Max program is outstanding! 1.Fully uses the Windows XP user interface. It looks very nice! 2.Fast and small! 3.Has the right features! 4.Priced right. I hope you keep the promotional price. Home users and students cannot afford software like Visio. Thank you for a simple-to-use drawing program! I am an engineer and have been beaten to death by Visio. With Edraw Max, I was able to finish a report on time and got praise from my boss for the illustrations. Thanks you for your support. I can't tell you how often I marvel at the amount of work and skill that must have gone into this product. It's very impressive piece of programming.